Planet Comicon 2012!!! Edward James Olmos Q&A!! 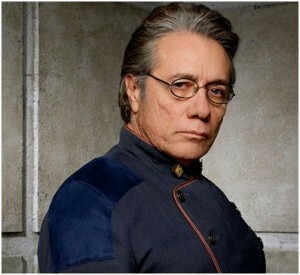 Boomstick Comics was present for a Q&A panel with Edward James Olmos at the recent Planet Comic Con in Kansas City. He talked about his career, his character development on ‘Miami Vice,’ and his work on ‘Stand and Deliver,’ ‘Blade Runner,’ and ‘Battlestar Galatica.’ He mentioned that “Blade Runner” is a continuation of ‘Battlestar Galatica’ and he jokingly revealed that Gaff caught Deckard. This was a blast. Enjoy the video video. This entry was posted on Tuesday, April 17th, 2012 at 4:34 pm	and is filed under Events, News. You can follow any responses to this entry through the RSS 2.0 feed. You can skip to the end and leave a response. Pinging is currently not allowed. « Bryan Reviews ‘Save the Date’!! !